Apple is in the process of rolling out a new feature for iOS devices running older versions of the software, which allows the last compatible version of apps to be downloaded. Apple's new iOS 7 software becomes available for iPhone, iPad and iPod touch owners on Wednesday, but for handsets like the iPhone 3GS it's the end of the road when it comes to software updates. With developers busying themselves with updating the apps for re-imagined software, the new feature will give those owners incapable or unwilling to use iOS 7 the ability to continue using their favorite apps. According to reports today, the new notification pops up asking if users wish to install the last compatible version when they attempt to download an app that's not supported by their version of iOS. 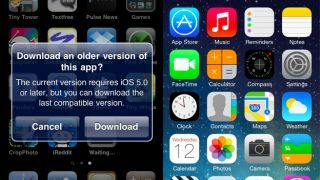 The decision to make the older versions available, first spotted by a Reddit user, keeps devices like the iPhone 3GS and original iPad alive and kicking, despite their incompatibility with iOS 7. It could even encourage some estranged iPhone users to dig the old handset out of the closet and give things another whirl. For those anticipating iOS 7? Well, for you guys the wait is almost over.